by Richard Solly, Co-ordinator, London Mining Network, with assistance from Andy Higginbottom, Daniel Selwyn, Maren Grimm, Markus Dufner, Nima Mudey and Tilman Massa. A loud and colourful demonstration took place outside the meeting venue for an hour before the AGM began. Several of us then went in to the AGM to demand justice for mine workers and their families suffering around the company’s operations at Marikana, South Africa, where a massacre of striking mine workers took place in August 2012. 2. He said that the AGM was not the forum to discuss or approve the proposed takeover by Sibanye Stillwater and asked shareholders to defer any detailed questions on this matter until the Extraordinary General Meeting. 3. He said that 2018 had seen Lonmin return to profit ($101 million), closing the year with an improved net cash position and improved collaboration with stakeholders. Platinum group metal (PGM) prices had improved. The rand was stronger against the dollar. The company’s safety indicators showed significant improvement. A fifteen month fatality-free period had ended with a worker death in September 2018. Two had occurred more recently – one on 5 December and another on 19 March. He said that zero harm was possible and that the company works hard with all stakeholders to achieve it. 4. He said that the company was committed to improving the living standards of its employees within its financial constraints. It was committed to delivering on its Social Labour Plan, especially regarding housing. This has an impact on workers’ ability to work well, he said. It had committed 500 million rand to housing projects from 2014 to 2018 and pays ‘living out’ fees for workers who do not want to live in company accommodation. The promised accommodation units continue to be delivered. In 2019 the home ownership plan commenced. 5. He said that the company’s refinancing removes the ‘tangible network covenant’ associated with the previous financing. This improves the situation but only lasts three years and the company’s liquidity is still insufficient to drive expansion and avoid job losses. 6. He said that figures for the first quarter of the company’s current financial year, to the end of December 2018, were down, especially because of the fatalities and associated safety stoppages, which affected production. Incidents of fatalities impacted on morale and production. There were adverse conditions at one shaft. Poor production and high unit costs had continued into quarter two, offsetting improved PGM prices. 7. He thanked the company’s employees for their hard work. He thanked board and the executive team, especially Chief Executive Officer Ben Magara and Chief Financial Officer Barrie van de Merwe for their financial discipline and motivation. One shareholder called out “Here, here!” very loudly. He later argued vigorously with our friends Andy Higginbottom of Marikana Miners Solidarity Campaign and Daniel Selwyn of student movement Decolonising Environmentalism. 8. Regarding the proposed takeover by Sibanye Stillwater, he said that Lonmin was focused on factors within its control to preserve cash and liquidity. It had improved lost time by 26%. It had ‘reduced 8,000 positions’ [i.e. thrown 8,000 workers out of a job…]. It had kept unit cost increases below inflation. It had kept cash discipline. It had achieved its key objective of being net cash positive at the end of every quarter. But it was nonetheless constrained and unable to fund the investment required. Challenges were facing Lonmin and the whole industry. The company was vulnerable to PGM price volatility and exchange rates. It needed a sustainable solution to the problem. The board unanimously recommended the all share takeover offer from Sibanye Stillwater. This would create a larger, more diversified and stronger company. It would enable shareholders to benefit from the synergies of the situation. The merger had been delayed by the appeal filed by mine workers’ union AMCU. As this would not be heard until April the ‘longstop date’ by which the merger was hoped to have been completed had been put back from 28 February to 30 June. Brian Beamish said that the delay was detrimental to all stakeholders. He noted that under the UK takeover code there were restrictions on disclosure of new information regarding the takeover, and this would mean that he may not be able to answer detailed questions about the matter at the AGM. 9. He then called for questions. 10. An elderly shareholder, who said he was 90 years old and had owned Lonmin shares for a long time, said he was concerned about the health and safety of the company’s workers. Clearly referring to the Marikana Massacre, he said there had been a ‘big problem six years ago’ and asked how the company was solving it. 11. Brian Beamish replied that the board regarded the safety and health of its employees as key to its existence. It was non-negotiable in the way Lonmin operates, he said. The company had recently been fairly successful – before Sept 2018 it ran for 15 months without fatalities, proving it can run without fatalities. Safety is the first item of every meeting. There is a programme of very visible leadership regarding safety. There are safety improvement programmes at all levels of the business. It is dreadful when someone dies at work. Death breaks momentum and morale. It has a negative impact on both morale and results, creating difficulties emotionally and in production. There is a close link between the two. Safety is key to production. 13. Another shareholder asked how families of labourers were notified of fatalities. Brian Beamish said that they were notified personally and invited to the site to see what had happened, and statutory payments were made, and work offered to family members. 25. Daniel Selwyn, from student movement Decolonisin Environmentalism, said his question concerned “the company’s reputation currently and historically, involving its violation of the sanctions regime and upholding of the infamous apartheid system. We have spoken about financial difficulties,” he said, “but Lonmin paid $607 million in dividends to its shareholders in the four years preceding the massacre. Lonmin also diverted $160 million to tax havens in Bermuda. Just 20% of your shareholders’ dividends would have paid for the 5,500 affordable homes you are legally obligated to provide your workers and the community with in your Social Labour Plan. In 2007, the International Finance Corporation invested $50 million in your company, $15 million specifically for community development. But in 2012 when the Massacre happened, you had built just three, uninhabitable show-houses. At the time of the massacre, company CEO Ian Farmer was earning 236 times more than the mineworkers were murdered for demanding in 2012. 27. A shareholder turned and pointed at Daniel, shouting, “That’s a cheap question. That’s cheap, mentioning black lives.” Daniel repeated the pay differential to him. 29. Daniel asked, “Why can executives get millions in bonuses while workers who demand more money for working in very dangerous work do not get it? This is exploitation.” Brian Beamish said he appreciated Daniel’s view but did not share it. 30. Nima Mudey, also from student movement Decolonising Environmentalism, asked about the period of notice for shareholder meetings. She said: “My question concerns the period of notice for shareholders’ meetings. Notice of this AGM was sent out just over three weeks ago, in accordance with UK law. However, this period of notice is very short for representatives from South Africa wishing to attend the meeting to raise matters of pressing concern for the communities affected by the company’s operations at Marikana. Our friends Bishop Jo Seoka and lawyer Andries Nkome applied for visas to visit the UK to attend this meeting but as of Friday afternoon they had not received them, making it impossible for them to attend. 31. “The average time to process a visa according to the British government website takes between 10-15 days, with some cases taking up to 60 days to be fully processed. This of course does not include weekends, making the three week notice far too short to ensure the communities’ voices are represented here in this meeting. The cost of the visa is 1851 South African Rand, roughly £100 sterling, which, coupled with the cost of flights, is another obstacle barring their presence here today. This isn’t an accident, because within the Hostile Environment enforced by the Home Office there have been many cases where applicants from African nations have had their visa applications delayed or denied for trivial or simply untrue reasons. 32. “In an article from the Guardian, specialist immigration lawyer Jan Doerful said he believes that there is a “general refusal culture, both within the Home Office and UK Visas and Immigration at entry clearance posts [and] there appears to be a deep underlying racism (whether direct or indirect) in the way many applicants are treated – meaning they may actually meet all the immigration rules, such as maintenance and accommodation, but unlawful reasons are found to refuse them that they will never be able to supercede and that are purely motivated by racism, coupled with a desire to keep numbers low. 33. “Yet British passport holders do not require a visa to visit South Africa for less than 90 days. What is this double standard? Another way, perhaps, for Britain to remind the world of its status as a former coloniser, who can still freely move around the world without visas to restrict them, but will not allow a reciprocal relationship, instead creating huge hurdles through extortionate visa fees and slow processing times – with no guarantee of acceptance – to prevent those especially from the Global South entry in the name of protecting its borders. 37. Another long-term shareholder asked whether there would be another rights issue and whether Lonmin would be delisted from London. 38. Brian Beamish replied that the board believed that the transaction with Sibanye Stillwater offered a comprehensive solution to the issues facing Lonmin. They had no expectation of a rights issue. The transaction would give the company the money it needs to diversify to withstand the current difficult conditions, which is why the board recommends it. It would take place according to the Scheme of Arrangement. All Lonmin shares would flow to Sibanye Stillwater and Lonmin would then be delisted. 40. He then said: “You might remember that one year ago, South African citizens Bishop Johannes Seoka and Andries Nkome, the lawyer for the wounded and arrested of the Marikana massacre, attended the Lonmin AGM. This year they couldn´t get a visa to visit the UK on time, so now I will bring forward their demands and questions to the Lonmin management. 41. “My name is Markus Dufner, I work for the Association of Ethical Shareholder Germany which is part of the international network Plough Back the Fruits. 42. “Mr. Beamish, Mr. Magara: Please explain to the shareholders of Lonmin how justice could be done to the widows of the miners, the workers who survived the Marikana massacre of 16 August 2012 and the community of Marikana. 43. “Compensation should be fully implemented in relation to the widows! Five and a half years after the massacre the issue of compensation for the widows still is not finalized. This is very painful for these women and their families. Mr Beamish, Mr Magara, what did the Lonmin management do to accelerate this never-ending process? 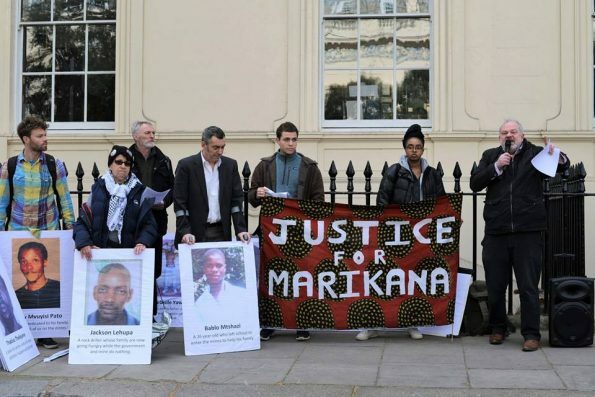 In December 2018, 100 activists started a trek from Marikana, in the North West province of South Africa, to the Union Buildings in Pretoria, demanding compensation for the widows of the 34 killed mineworkers. They handed over a list to President Cyril Ramaphosa in which they demanded the finalisation of the compensation to widows of the Marikana massacre. 44. “Mr Beamish, Mr Magara, can you confirm, that Mr Ramaphosa still owns 8 percent of the shares of Lonmin? Perhaps he could personally help the widows. 46. “Nkome added that his clients say they only receive information on the payments through the media. ‘These people have not had direct correspondence [from the department of justice] as to where their payments are and have been hearing about it in the media and this is how justice has continued to treat them,’ Nkome said. ‘The miners keep calling us and asking if we are sure that we have not received the payments. They clearly do not believe us when we say there has been no payment.’ Do have any secure information if the payments have finally been issued? 47. “A memorial monument should be erected! Bishop Seoka demands, that ‘as a gesture of goodwill Lonmin must make a significant contribution for a memorial monument that will provide for the healing of memories and help with the reconciliation in Marikana.’ Mr. Beamish, Mr. Magara, is the Lonmin management ready to make a contribution? What would you consider as ‘significant’? To get it clear: Bishop Seoka and the Marikana people do not want a museum of mining – as you seemed to understand last year! 50. Regarding the widows, he said: “We as Lonmin, when the unfortunate events unfolded in 2012, we made sure that all statutory payments were made to the families as quickly as possible and offered employment to a family member so money would continue to flow into the family and mostly it was the widows who took up the employment. We then set up a trust to provide education for children in all of the affected families, 141 people. The company did what the company could do to ameliorate the horrible effects though nothing makes up for the loss of a life. Regarding what the government has done, we cannot help you as they do not consult with us about any payments they make and we do not know. Regarding instructing SABS services not to pay, I know nothing about that whatsoever. 51. “Regarding the memorial, on the 5th anniversary of shooting we put a lot of effort and time into preparing a proposed memorial. We did the best we could to apply our minds and included all stakeholders and put it to interested parties but we have made no progress. We do want a memorial and we will fund it and it should be at koppie but the holdup is with AMCU. We have asked AMCU to help us but it is they who are holding it up. Some Shareholders Do Not Want to Hear About Massacres But Want to Get On With The Meeting’s Business! 53. Another long-term shareholder said, “My sister worked for Lonrho for 42 years. This meeting has been disrupted for the past few years. Can we get on with the resolutions of this meeting? People can speak to directors after the meeting.” There was loud agreement from several shareholders, and some applause. 55. Another shareholder asked that directors should publicise how many shares they own in the company. Brian Beamish pointed out that this was on page 97 of the annual report. 56. Maren Grimm, speaking on behalf of German Ethical Shareholders, said: “Regarding salaries, direct and indirect employment, subcontractors earn only a quarter of the amount you summed up, so please give us numbers of directly employed and subcontracted workers.” She then asked about Lonmin’s business relationship with BASF. “Will it be taken over by Sibanye Stillwater? Has there been consultations between BASF and Sibanye Stillwater on how to proceed with this relationship? What is the total amount of platinum and other products sold to BASF? And can you also name the other products and the respective amounts sold? What is the total percentage of production sold to BASF? To which subsidiary company of the BASF enterprise exactly are you selling the metals?” She then offered the Chairman a copy of a recently published English language book, Business as usual after Marikana, about Lonmin’s business relationship with BASF, pointing out that the German edition had already been very well publicised. 59. Brian Beamish said that this was a snapshot of the year-end figures. He said that as the company had reduced the work force, both employees and contractors, the ratio had stayed broadly similar. The relationship with permanent employees is more stable than that with contractors. 60. Maren asked whether teams working underground were a mix of employees and subcontractors. 62. He moved on to the issue of sales figures. He said that the number of ounces or percentages sold to particular customers were commercial issues which the company does not divulge. As for awareness of the transaction with Sibanye Stillwater, Lonmin had spoken to all its customers. Contracts would all go with the business to Sibanye Stillwater if transaction were approved. 63. Tilman Massa, of German Ethical Shareholders, asked about environmental impacts. He said: “Social movements and communities affected by your mining operations demand that you take responsibility for pollution and ecological devastation at Marikana. You should ensure that people in the communities around the mine have sufficient and clean water, proper sanitation and electricity. 64. “You reported seven environmental incidents for 2018. One severe incident took place on 26 February 2018, when approximately 4,000 tons of slurry from a bulk tailings treatment pipeline spilled into the environment, also entering a river at Marikana. You submitted a rehabilitation plan that should conclude this year. Are you on track with your rehabilitation obligations and how will you make sure those incidents will not happen again? 65. “You set a new reduction target to reduce absolute scope 1 and 2 Green House Gas emissions by 4% by 2022 from a 2017 baseline. But your scope 1 and 2 GHG emission increased by almost 2,000 tons last year. How will you make sure you will reach even your own, very modest goals to fight climate change? 66. “Can you guarantee you will meet new South African emissions standards on hazardous waste streams such as liquid acid and calcium sulphite required by 1 April 2020? In your current sustainability report you say you are “on track” to meet the new requirements, but calcium sulphite emissions even increased from 2017 to 2018. 68. Brian Beamish replied: “We care a lot about the environment. Zero harm philosophy is not just about safety but about the environment. The world isn’t perfect. We did have an incident last year. We were commissioning a new tailings facility, pumping inert slurry across the property along an extended distance. The pipeline sprang a leak at one of the joints. Slurry escaped into the environment and we notified the authorities and came up with a clean-up plan which will be implemented this year. It will all be taken care of as expected. Everything will be made good. 70. Finally, a shareholder asked about accountants KPMG acting as auditor again. Brian Beamish said that they had audited Lonmin’s accounts for around 42 years but this will the last cycle and they will not be invited to bid again. 71. Polls were then conducted on the items of business. All the company’s proposals were accepted with huge majorities except for the Remuneration Report, which was rejected, and the Chairman noted that this was because of the Sibanye Stillwater deal being held up. There would be further consultation with major shareholders. 72. The Chairman was clearly unsettled by the points that Daniel made: immediately the meeting ended, he approached Daniel and opened a conversation with him. 73. He was eager to address pay differentials. He said the system might be wrong but it’s a reality: there are different markets for leadership and for workers. Marikana is a social project – shareholders are not making any money but are still paying for housing and the education of the community. Daniel asked how much he makes personally out of this social project. Brian Beamish replied that as a non-Executive Director without bonuses he makes a flat rate of £55,000 a year, which he and Daniel calculated as over four times as much as most of his employees. 74. Regarding worker fatalities at Sibanye Stillwater, Brian Beamish said that Lonmin had one of the best records in South Africa and was now advising Sibanye Stillwater on how to improve. Daniel asked, “Can you not see our concern that a company responsible for the massacre of its workers is giving lessons on worker safety? ” Brian Beamish replied that Marikana would tarnish Lonmin’s reputation forever, but it could have happened at any mining company in South Africa. He was working at Anglo Platinum at the time, and it could have happened there, he said. Since joining Lonmin he has found it to be a very caring and respectful company.